"The end is coming. Season 8 of Game of Thrones is upon us. And if you’re as excited as we are, you’ve been counting down the days, re-watching episodes on HBO on The Roku Channel, and reading all the predictions the internet has to offer about what the final six episodes will bring. In order to mark the ending of such an iconic series, we’ve partnered with HBO to create something very special. 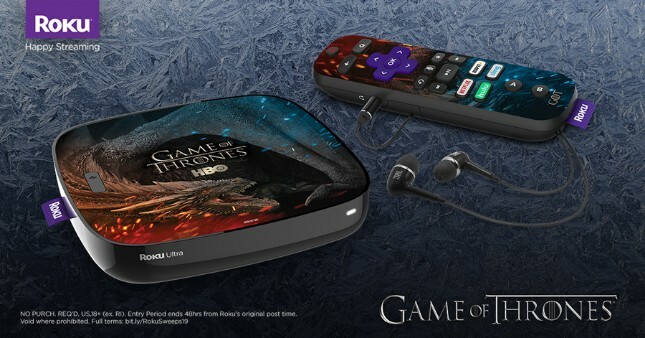 For the first time ever, we’ve produced six limited edition Game of Thrones skinned Roku Ultras," says Darcy Mekis, Roku. Mekis shares how to enter below. If you are planning to watch Season 8 of Game of Thrones anyway, you might as well Tweet afterwards and try to win one of these limited edition Roku Ultra media boxes. Value of the device itself aside, it could be a very valuable collectible to rabid fans of Game of Thrones. eBay, baby!